There are a few peer loan websites that I’ve used regularly and some with really great features but there’s no answer of which is the best p2p lending site for everyone. Just like every borrower is different, each peer lending website is different and has set its mark by focusing on a different type of borrower. That means the peer loan site that works for you may not work for me. There are some factors that will help you decide which is the best peer to peer lending site for your loan. Taking an hour or two to understand these and how they differ across p2p lending sites could save you thousands of dollars in interest. On the surface, most peer to peer lending sites may look the same to borrowers. They all promise an easy application process and money within a few days, some even promise to get you money the same day. Assuming all online loan sites are the same though is a good way to get taken by some of the peer lending scams and get locked into high interest rates. There are differences in key areas across each of the peer loan sites and you can save hundreds of dollars by taking the time to understand what to look for on each site. Rates on personal loans generally start at 6% and range as high as 36% for bad credit peer lending. Your interest rate will mostly depend on your credit score but may vary by as much as a few percent depending on the lending site. I’ve constructed a graph of interest rates by credit score to help you see if you’re getting a good deal. The data is a couple of years old but should still be in the ballpark. FICO requirement – One of the biggest differences among the P2P lending sites is the credit score requirement for loans. 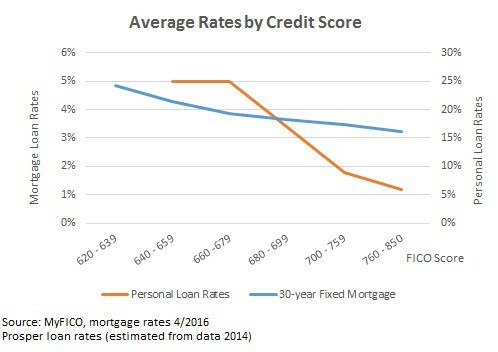 Some sites require higher credit above ‘prime’ which is around 640 FICO. 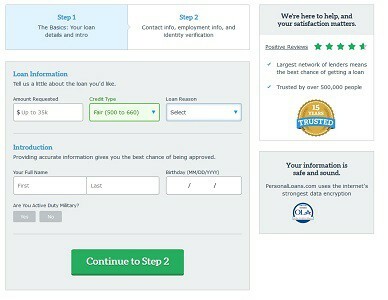 This really separates where you can apply for a loan. Those that only accept 640 or above tend to offer better rates though the ones with less strict credit requirements can still be a great tool for bad credit borrowers. Origination fee – Most peer to peer lending sites will charge an origination fee on your loan and take that money out before your loan is funded. A few will offer 1% origination fees to borrowers with very high credit scores but most fees are between 5% or 6% of your loan amount. Finding a site with no origination fee can really lower the overall cost of your loan, basically saving $50 for every $1,000 borrowed. Application requirements – Besides requiring a certain FICO credit score requirement, peer lending websites may also require a certain level of income or a maximum debt-to-income level. The stricter sites generally require annual income around at least $36,000 and no more than 35% on debt-to-income. Availability in your state – Whether the peer lender can even make a loan in your state is going to be the first question you need to ask. Most of the best peer to peer lending sites I’ve used or reviewed are available in all states but you’ll still need to check availability. All peer loan platforms must be licensed in each state where they do business so you should check the fine print at the bottom of the site to make sure they are licensed and not operating illegally. Other fees – Miscellaneous fees are actually one area where most online peer loans are fairly similar but you should do a little comparison shopping anyway. Most sites will allow you a 15-day grace period on your payment before charging a late fee of $15 or 5% of your remaining balance, whichever is greater. Most sites allow you to make payments free through direct deposit but charge a fee to pay by check. It’s true that applying for a loan on peer to peer lending sites won’t affect your credit score. This is because the loan website does what’s called a ‘soft inquiry’ first just to verify some of your basic information. It’s not until you accept the loan terms and interest rate that the p2p site does a ‘hard inquiry’ on your credit that will affect your score. This means you should check your rate on a loan across different peer lending sites to make sure you’re getting the best deal. You don’t need to check every website because you should be able to get a sense of the best peer to peer lending sites just looking through some of the areas noted above. To get you started, I’ve highlighted some of the best peer loan sites I’ve used and others I’ve reviewed below. PersonalLoans is one of my preferred peer loan sites and one that I’ve used for a loan when I had bad credit. Borrowers with credit scores as low as 600 FICO can get a peer loan of up to $35,000 and borrowers with lower credit scores (580 FICO or Higher) can get approved for a personal loan. Income requirement is as low as $2,000 per month and can be from employment or self-employed sources. Rates range from 6% to 36% with loan durations from 90 days to 72 months. As with any peer lending site, I would highly recommend against short-term loans of less than a year. These are going to have higher rates and payments. You’re much better off taking out a longer-term loan and just paying it off early. Lending Club is the largest peer to peer lending platform in the world with nearly $19 billion in peer loans funded. The p2p site offers small business loans as well but they only account for about 2% of all loans made. Loans are available for up to $40,000 and up to 60-month terms. 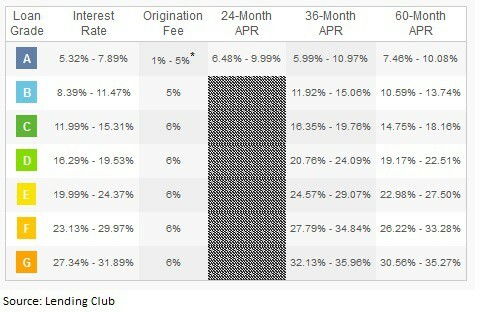 The interest rate on Lending Club loans starts exceptionally low for good credit borrowers though rates for other borrowers will be similar to what you’ll find on other sites. Lending Club has said that it is tightening restrictions on loans to restore investor confidence after some news this summer. Upstart is a peer to peer lending site for students and recent graduates. The website uses a unique program to make lending decisions based on your academic record and the school you attended. This ability to help graduates with no credit score is one of the reasons more than 90% of borrowers have a degree. For those without a degree or those with an established credit score, the requirements are a little higher and you might be better off getting a loan on another site. Prosper is the second largest peer lending marketplace after Lending Club but hasn’t grown nearly as quickly. The sites are similar though Prosper does not offer business loans. Loans are available up to $35,000 and for any reason including debt consolidation, home improvement and for personal use. SOFI is a unique peer lending platform in that it offers student loans and mortgages along with personal loans. Personal loans are also available at higher amounts and for longer payoff durations compared to other sites. You can get a seven-year personal loan for up to $100,000 if you qualify. The key here is ‘if you qualify’ because SOFI is picky about its borrowers. You may need a credit score of close to 700 or higher to qualify but rates range from just 6% to 13% on an APR basis. There’s also no origination fee on a SOFI personal loan, saving even more money and you may be able to defer payments if you become unemployed. Which P2P Lending Site is Best for Your Needs? Picking the best peer to peer lending site will depend on the factors above. Your credit score will determine whether you can get a loan from any site or just the peer lending sites for bad credit borrowers. The time you need to pay off your loan, whether three- to seven-years may also mean you’ll want to pick one site over another. I’ve highlighted some of the best peer loan sites for different situations below. 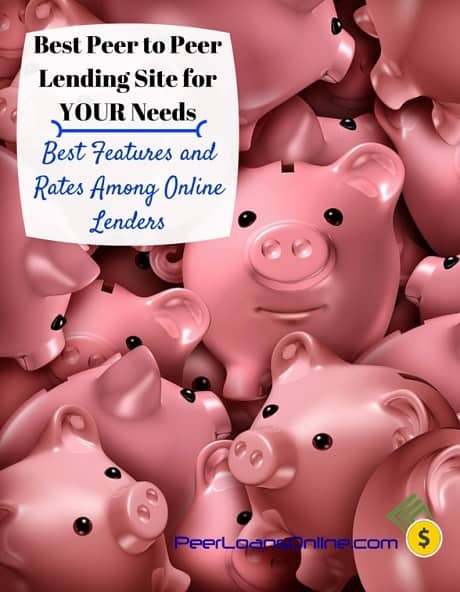 Make sure you read through the features on each site above to really understand each p2p lending site’s strengths and why it might be better for your needs. What is the Best Peer to Peer Lending Site? For bad credit loans, really two sites come out ahead of all the rest. It’s not just that bad credit borrowers may not get approved on other sites but the two peer loan sites here offer other advantages as well. PersonalLoans is my top pick for its loan aggregator feature where lenders compete for your loan. It’s one of the few opportunities you’ll get for lower rates if you have bad credit. The site is also unique in that it can offer peer loans, personal loans and traditional bank loans depending on your qualifications. Upstart is another strong contender for bad credit personal loans, especially with its unique loan application that can extend credit to people with no credit score or a limited credit history. Upstart is a great start for loans for recent college graduates because it takes into account education in its lending model. I can’t fault the peer loan sites for having high credit score standards. Banks are still reeling from the financial crisis and the peer lending industry doesn’t want to be caught in the same mess. Peer lending sites have to answer to investors that may not want to buy loans of bad credit borrowers, so some sites have cut off their loans at a certain FICO score. As the largest peer lending site in the world, Lending Club can afford to be picky with its loans and requires a FICO score of 660 or higher for most loans. As with most websites, they relax the rules for repeat borrowers but you’ll need a fairly high credit score for the first loan. The tradeoff is that rates tend to be lower even for borrowers that barely make the cutoff. SOFI may be one of the most difficult sites on which to qualify but it also offers the lowest rates among any online lender. The site doesn’t make public its minimum credit score but I’ve heard from many borrowers that were denied a loan and were able to get one through other peer lenders. Besides personal loans, SOFI offers student loans and mortgages at very competitive rates. If you have a decent credit score, I’d definitely check the rate on SOFI before taking out a loan. One of the best features of peer lending is that it isn’t just about borrowing for loans. It may not matter to you if you need a loan but the p2p sites can also be great investment opportunities. Returns on peer loans are much higher than traditional fixed income bond rates and comparable with stock returns. Check out this interview I did with a peer loan investor that has made $10,000 on p2p investing. Lending Club has helped fund over $18.7 billion in loans. As a peer to peer lender, that money had to come from somewhere. Investors select the loans in which they want to invest and can put as little as $25 to each selected loan. Returns on diversified portfolios range as high as 9% and pay cash each month on payments. Prosper hasn’t gotten nearly as much attention as Lending Club but is one of the largest peer lending sites with billions in loans funded. Investors can filter for individual loans or set their account on automatic to invest in loans that meet certain criteria. We’ve covered the process to get a peer to peer loan in an earlier post on how to consolidate debt, so I’ll just go over the highlights here. The most important point is that you use your peer loan as a way to get out of debt rather than as a way to spend more. Click through to any of the peer to peer lending sites above and the loan process will be almost identical. If you agree to the rate, you then fill out more detailed information on your income and debt. You will link up your bank account to receive the funds and to make monthly payments. The whole process generally takes less than five minutes. The peer lending site may ask you to verify your income with a copy of your W-2 and driver’s license but this usually only happens with about one-in-three applications. It may take up to three days to fund your peer loan depending on the website but most borrowers get their money within five days. The money will go straight to your checking account minus the origination fee. Your payment will come out of your account each month and the p2p loan site will update you on remaining balance, interest paid and all the other information you would see with a traditional loan. Hopefully now you know there may not be a single best p2p loans site. The truth is that it depends on your situation and your needs as a borrower which website will work best. Factors like your credit score, how fast you need the money and for what purposes will help answer the question. What’s my credit score? If your credit score is above 680 FICO, you’ll get better rates on some sites that might not be available to bad credit borrowers. If it’s below this subprime score, you can still get an affordable loan but need to know where to look. How fast do I need the money? Some peer-to-peer websites specialize in fast money, usually within 24-hours. Other sites have longer and stricter application requirements, verifying more applications and usually take from three- to five-days to deposit your money. Do I want different loan options? Some p2p sites are loan aggregators, meaning they shop your application around to different lenders. This usually gets lower rates and more options but can take longer. Other sites do the lending themselves so they can get your money to you faster. Can I pay the loan off early? Most p2p sites charge no prepayment penalty but you have to make sure. Paying off your loan early can save thousands in interest but not if there is an additional fee. Picking a peer-to-peer lending site is a much bigger decision than most people understand. This is tens of thousands of dollars you’re borrowing and could cost you tens of thousands in interest. That is years of payments and choosing the right website will help you get back on your feet as fast as possible. If you’re using a peer loan for debt consolidation, cut up those credit cards afterwards! Don’t fall into the mistake of maxing out your cards again after paying them off with your personal loan. Making your monthly payments on the peer loan will help boost your credit score and open up a whole new world of credit. After a couple of years, you can reapply for credit cards at a much better rate and more favorable rewards programs. If you don’t need a peer loan immediately, try improving your credit score with these three credit score hacks. The best peer to peer lending sites for one borrower may not be the same for another. Make sure you shop around a little and understand how each peer loan site differs from the others. Just an hour of research can save you thousands on interest payments, especially on bad credit peer loans. This is a very good informative post that does an excellent job of introducing the concept of peer-to-peer lending sites. Thank you. Very nice and profitable article indeed! You have shared good points about which P2P lending site is best that I never thought about.